All features of the FMA6600 and FMA6700 Series flow meters can be accessed via the local four button keypad and LCD. 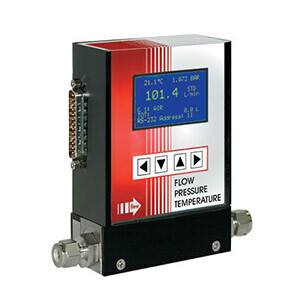 The digital interface operates via RS485 (optional RS-232 available) and provides access to applicable internal data including: flow, temperature, pressure reading, auto zero, totalizer and alarms settings, gas table, conversion factors and engineering units selection, dynamic response compensation and linearization table adjustment. The analog interface provides 0 to 5 Vdc or 0 to 10 Vdc or 4 to 20 mA outputs for flow, pressure and temperature (jumper selectable). The FMA6600 and FMA6700 Series supports automatic sensor zero offset adjustment that can be activated locally via keypad or remotely via digital interface. The auto zero feature requires absolutely no flow through the meter during auto zero process. Provisions are made to either start, stop or save the current auto zero value via digital commands. The total volume of the gas is calculated by integrating the actual gas flow rate with respect to time. Both keypad menu and digital interface commands are provided to: • set the totalizer to ZERO • start the totalizer at a preset flow • assign action at a preset total volume • start/stop totalizing the flow • read totalizer Totalizer conditions become true, when the totalizer reading and the "Stop at Total" volumes are equal. High and Low gas flow ALARM limits can be preprogrammed via keypad or remotely via digital interface. ALARM conditions become true when the current flow reading is equal or higher/lower than corresponding values of high and low alarm levels. Alarm action can be assigned with preset delay interval (0-3600 seconds) to activate the contact closer (separate for High and Low alarm). Pressure Alarm (FMA6700 Series) High and Low gas pressure ALARM limits can be preprogrammed via keypad or remotely via digital interface. Pressure alarm conditions become true when the current pressure reading is equal or higher than corresponding values of high pressure alarm settings or equal or lower than corresponding values of low pressure alarm settings. Alarm action can be assigned to activate the contact closer (separate for High and Low pressure alarm). Temperature Alarm (FMA6700 Series) High and Low gas temperature ALARM limits can be preprogrammed via keypad or remotely via digital interface. Temperature alarm conditions become true when the current temperature reading is equal or higher than corresponding values of high temperature alarm settings or equal or lower than corresponding values of low temperature alarm settings. Alarm action can be assigned to activate the contact closer (separate for High and Low temperature alarm). The flow set points, measured gas flow and associated totalizer data are scaled directly in engineering units via the front panel keypad or digital interface. The following units of measure are supported: %F.S., L/min, L/h, mL/min, mL/h, SCFH, SCFM, LbPH, LbPM, User Defined EU. The FMA6600 Series is capable of storing primary calibration data for up to 10 gases. This feature allows the same FMA6600 Series to be calibrated for multiple gases while maintaining the rated accuracy on each. Optional up to 9 additional 10-point calibration may be ordered at an additional charge per gas. Conversion factors for up to 32 gases are stored in the FMA6600 and FMA 6700 Series. In addition, the provision is made for a user defined conversion factor. Conversion factors may be applied to any of the ten gas calibrations via keypad or digital interface commands. FMA6600/FMA6700 Transducers should not be used for monitoring Oxygen gas unless specifically cleaned and prepared for such application. See below for ordering details. Output Signals: Linear 0 to 5 Vdc (3000 Ω min load impedance); 0 to 10 Vdc (6000 Ω min impedance); 4 to 20 mA optional (500 . max loop resistance). Maximum noise 20 mV peak to peak. Input Power: Is available to run at three different voltages: ±15Vdc (±200 mA maximum) or +12Vdc (300 mA maximum) standard; +24Vdc (250 mA maximum) optional (-24VDC); Circuit boards have built-in polarity reversal protection. Resettable fuses provide power input protection. Calibration: Standard one 10 points NIST calibration. Optional up to 9 additional calibrations may be ordered for an additional charge per gas. 참고: Comes complete with operator’s manual and NIST traceable certificate for Nitrogen. Note: Flow rates are stated for Nitrogen at STP conditions (21.1°C (70°F) at 1 atm). For 12Vdc power, add suffix "-12VDC" to model number; add $100 to price. For 24Vdc power, add suffix "-24VDC" to model number; add $200 to price. For perfloroelastomer, Buna or EPR o-rings, VCR fittings, or RS232 communications, consult Flow Engineering for a quote. For each additional calibration add -(*) to the part number and $300.00 to the cost. For Oxygen cleaned units, add suffix "-C" to the model number; add $125 to price.